I finished my socks. They are unremarkable and I'm hoping to improve on this new short-row heel technique I've learned. These socks were knit with size 2 dpns, which are easily my favorite size. I just cast on 64 stitches and knitted a cuff of 12 rows of K1, P1 (but you knit through the back loop of the knit stitch). 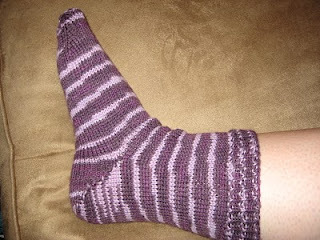 The foot and leg are simple knit stitch all the way around. 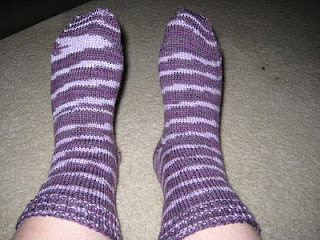 The socks don't have a good fit, probably because the garter stitch does not have very much give. I've started a new pair of socks, but this time I'm going to do the leg and cuff in a rib pattern, to (hopefully) insure that the fit is more snug. The color pattern of this yarn is also variegated - this time it is greens and browns and gray and turquoise. I'm planning to knit more of a knee sock. We will see how this first sock goes. I finished Sock One of the variegated sock yarn. Of course, true to my knitting prowess, it's a bit on the big side. What makes this one special, to me, is that I learned a new heel technique called short row heel. While I'm not sure that I applied it correctly to this sock, I'm going to knit the second of the pair and then do a search on the internet to see if I did make a mistake. The wonderful thing for me is that I actually learned this strictly by reading! I didn't cheat by watching a video, which is not technically cheating, but I feel smarter being able to read and understand knitting instructions.